Ellevest – Invest Like a Woman. That’s the whole point of Ellevest. It’s a robo advisor investment platform designed specifically for women. We don’t want to get preach-y but, women, when you actually get into the investment markets, your returns trump those of men! So, do not delay and get started investing, NOW! Ellevest was cofounded by CEO, Sallie Krawcheck, and tech entrepreneur, Charlie Kroll. Sallie realized the investing industry has been “by men, for men” — and has historically kept women from achieving their financial goals. She’s made it her life’s mission to empower women financially, and get them to invest for their biggest goals. What Differentiates Ellevest Robo Investing From Competitors? Ellevest Review – Who Benefits from the Women-Focused Advisor Robo? What Are the Differences Between Ellevest Digital and Ellevest Premium? Ellevest was conceived and designed with their clients not just for them. They worked with real women on what investment guidance need — and created Ellevest together. Barbara, Robo-Advisor Pros CEO was pleased to receive a personal call from co-founder Sallie Krawcheck to discuss the Ellevest platform. 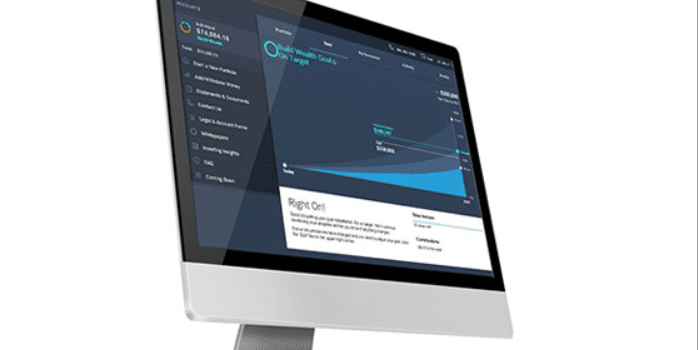 Overview Automated investment management robo-advisor that invests specifically with the needs and challenges of women in mind. Offers financial and career advisors. Minimum Investment Amount There is no minimum investment amount required for Ellevest Digital. Ellevest Premium requires a $50,000 minimum. Top Features Goals based investing, enabling you to invest in portfolios developed for various goals, such as emergency funds, retirement and home downpayment. Tax-minimization strategy. Premium service provides access to CFPs + career coaches. Free Services Free personalized investment plan and access to financial articles in resource center. Contact & Investing Advice Available by live chat, email or phone, during regular business hours. Investment Funds 21 low-cost, commission-free ETFs primarily from Vanguard. Other fund providers include Barclays, Nuveen, iShares, Charles Schwab and Van Eck. 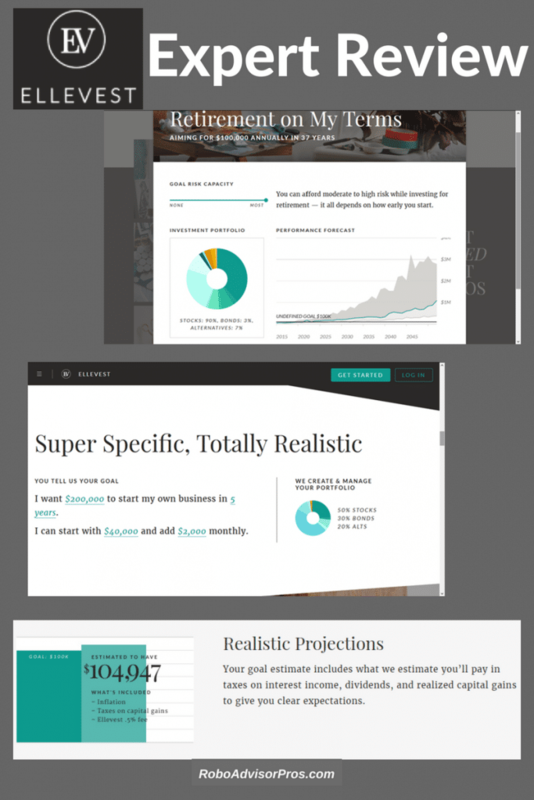 If you’ve ever seen those impressive looking investment projections that will turn you into a millionaire in 20 or 30 years, but doubted their reliability, you’ll appreciate how Ellevest calculates these – with a healthy dose of real world cynicism. After all, you’re not likely to earn 10% (or more) on your money each and every year over that time frame when predictable events are cutting into that return. Includes more poor market scenarios that are consistent with prior investment market performance. Ellevest portfolios recognize the major market reversals that began in 1987, 2000 and 2007. Recognizing poor market situations can lead to more realistic performance projections. Accounts for real world realities such as taxes, fees, and inflation. Typical investment projections seldom account for these realities, making projections overly optimistic. All of these acknowledgements can lead to more accurate investment results than is frequently presented by other investment funds. And as is the case with most investment platforms today, Ellevest does rely on Modern Portfolio Theory (MPT). MPT is the theory that it’s possible to maximize expected returns for a given level of risk in a portfolio by selecting the right mix of investment assets. Ellevest uses a goals-based investment approach, enabling you to invest in multiple goals at one time. They look at your profile, goals and timeline, then recommend goal-specific portfolios, target amounts, savings, and more for a completely customized investment plan. You can then explore changes to any aspect of your plan and see the trade-offs you can make among goals. In a word – women! The founders of Ellevest explain that 86% of investment advisors are men, with an average age of 50+. Ellevest is specifically designed with you in mind. That means that the apparently “gender-neutral” investment industry is tailored primarily to men’s salaries, career paths, preferences and lifespans. For example, Ellevest notes that while men’s salaries peak at age 55, women reach their earnings peak at 40. That can create a very different financial outlook. This results in women earning less money during their careers. It’s estimated that due to the gender pay gap, a woman will have $320,000 less in savings by age 67 than a man of the same age. What’s more, a woman can expect to live up to five years longer than a man on average. That means that a woman must provide for a longer retirement, but do so with less money. Ellevest is looking to balance the scales. Guidance and advice – Financial concierge service to answer money questions for Ellevest Digital customers. 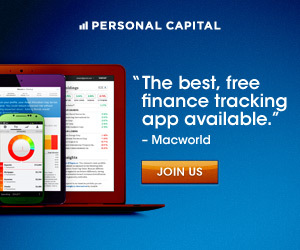 Certified Financial Planners and career coaches for Ellevest Premium customers. Ongoing management and alerts — Ellevest monitors your portfolio daily, and rebalances if needed. If you fall off track, they email you and give you a “heads-up” to let you know what to do to get back on course. Account custodian – Folio Investing is the broker/dealer and custodian for your Ellevest account. Folio is an SEC-registered broker/dealer and custodian. As the custodian, Folio safeguards the securities and cash in your account. Email, text and Phone Support — Available during regular business hours. Account protection — Your account is protected from broker failure though Folio, which is a member of the Securities Investor Protection Corporation (SIPC). That means that up to $500,000 in cash and securities, including up to $250,000 in cash, are protected. Automatic deposits – You can set these up by connecting your bank account to your Ellevest account. In each of Ellevest’s goal portfolios, the platform uses a Monte Carlo simulation. This is a forward-looking, computer-based calculation in which they run portfolios through hundreds of different economic scenarios to determine a range of possible outcomes. Monte Carlo simulations are used to model the probability of different outcomes in a process that cannot easily be predicted due to the intervention of random variables. We can think of is as a systematic strategy to predict the unpredictable, through use of various simulated scenarios. Ellevest uses low cost index-based exchange traded funds (ETFs) in the construction of portfolios. They invest in 21 different asset classes, with one ETF for each class. 14 of those ETFs are from Vanguard, while the rest are from Barclay’s, Nuveen, iShares, Charles Schwab and Van Eck. Following are the 21 asset classes, and their representative ETFs. Today’s investor strives to invest with their values while earning competitive investment returns. Companies with higher standards for sustainability and ethical practices. Companies that provide loans to support community services, women-owned businesses, and those in need. The Ellevest app is available for Digital and Premium clients with investment accounts on the Ellevest platform. The app is currently available for iOS 10 and above users. You can download the app at the itunes app store. An adroid app will be available soon. In the meantime you can visit Ellevest.com using Google Chrome on your Android device. You can perform all of the same activities – and more. The app is useful, but some tasks such as 401(k) roll over or setting up retirement goal can only be completed on the desktop version. In order to be eligible to open an account with Ellevest, you must be a U.S. citizen (or U.S. Resident Foreign National) with a permanent U.S. address (not a P.O. Box). You must also be of legal age in your state, and have a U.S. Social Security Number. You must also have a checking or savings account with a U.S. bank. Enter your email address and create a 10-character password. Enter your name, zip code, age, gender, education level, salary, marital status, and number of children, if any. Select up to five investment goals, then prioritize them in order of importance (Ellevest believes that investment priority is majorly important). Estimate your outside account balances – the money you currently have invested that will not be included in your Ellevest investments. Ellevest takes a holistic approach to investing, and will consider these balances in designing your investments for you. Establish investment targets. This is where you decide the frequency of investment contributions and the likelihood of reaching your investment goals based on the scenarios determined to be most likely based on your circumstances and profile. The Ellevest fee structure is simple. They charge an annual management fee of 0.25% of your account balance for Ellevest Digital. That means that you can invest $10,000 for a fee of $25 per year, or $100,000 for a fee of $250 per year. The fee is deducted from your account balance on a pro-rated monthly basis. The Ellevest Premium Plan gives you access to unlimited, scheduled calls with a Certified Financial Planner (CFP) and executive career coach. Any money in your emergency fund is not charged a fee. In addition to the annual fee, there are also underlying fees charged by the ETFs in your portfolios – which is typical of all robo-advisors. These fees range from 0.00% to 0.16% per year, making your effective annual fee 0.00% to 0.66%. It’s important to note that the ETF fees go to the fund company, not to Ellevest. Since there are no ETF fees or management fees on our emergency funds, some Ellevest clients could have effective annual fees of zero. For wealthier clients, with $1 million or more, Ellevest offers private wealth management. The services are designed for wealthier investors with more complex financial needs. Women with complex stock options or high tax bills profit from targeted private wealth management. Fees vary depending upon which services are selected. Women-centric investing, specifically taking into account the unique investment needs and challenges of women. Before signing up, you get a free financial plan. For Digital clients, access to financial concierge service for basic financial questions is useful. For Premium clients, human financial advisors and career coaches is a bargain at 0.50% of AUM. Ellevest looks at all of your financial accounts, not just the ones that they manage. This creates more accurate investment management. No minimum account balance. This is perfect for new and small investors. Once your account is opened, you can fund it with automatic deposits. In addition to stocks and bonds, Ellevest also invests your money in FDIC cash (most robo advisors don’t offer a cash option) as well as both US and International real estate. That provides a higher level of diversification than most investment platforms offer. Goals based investing that enables you to invest for many different needs, including retirement, emergencies, and saving for a home or a new business venture. Each requires a different investment strategy, and Ellevest offers them. Unique opportunity to view your Ellevest account through Mint.com. They offer among the most diversified ETF access including value ETFs, an international real estate fund and a municipal bond fund. Ellevest moves beyond merely investing your money and works toward improving your overall financial situation. Customer service is available only during regular business hours. No weekend or after-hours availability. Their tax minimization methodology is not a strict tax loss harvesting feature. For investors seeking specific tax loss harvesting, this could be a negative feature. There’s no designated socially responsible investment option, for investors seeking impact investing portfolios. Ellevest raised $34.6 million in venture capital, ensuring that it’ll be around for awhile. Included among the Ellevest investors are the prestigious Morningstar investment research company along with former Commerce Secretary Penny Pritzker’s PSP Capital, Rethink Impact and others. Finally, there aren’t many investment platforms available that are designed specifically for women. Ellevest does this by recognizing the gender pay gap, longer lifespans and specific goals that female investors have. The goal-based investing strategy also provides a series of specific investment targets, rather than merely tracking performance for a single investment fund. This will make it easier for women to establish and fund investment portfolios for specific needs. Since Ellevest has no required minimum initial investment or account balance, it favors new and small investors. Since this describes the investment profile of many women, who may be totally new to investing, the lack of a minimum balance requirement is a major plus. In addition, the fact that Ellevest is conservative with their investment projections makes them more realistic, and therefore more valuable for planning purposes. Though Ellevest has been designed specifically for women, it’s a platform that men might want to take a look at as well, for all of the same reasons that will appeal to women. And with the new, lowered 0.25% management fee for Ellevest digital, it’s a solid competitor to Betterment and Wealthfront. If you think Ellevest just might be for you, then click on this link and look around the portfolio. I always check out the FAQ for a quick view of the robo-advisor.